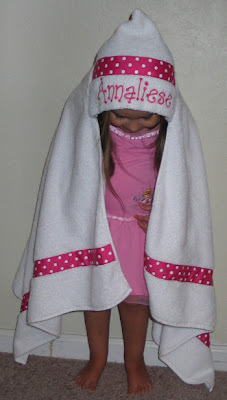 Annaliese loves her "Princess" toddler towel that I made at the beginning of May. It has been a challenge to tackle daily swim lessons and baths the last two weeks with only one towel! So today I made this one. 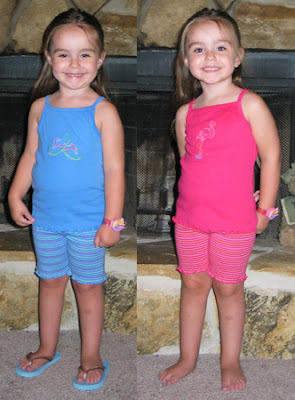 Her swimsuit is pink with white polka dots, so it will coordinate well. 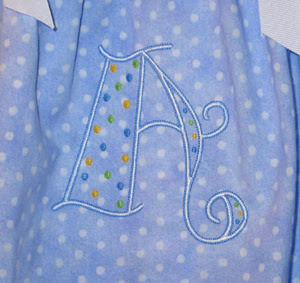 The alphabet (Casual Dot) was a freebie at Ann the Gran. Sigh... her crazy long name... it took 22 minutes to stitch that out! The second one... I was commissioned by Jan to make a toddler towel for her granddaughter, after seeing the ones I made for Bryce and Devin. 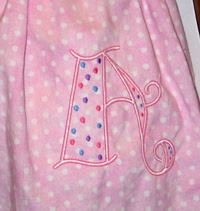 I took the crown from the design I used on Annaliese's, and used my newly purchased Curlz alphabet in Embird to do the lettering. 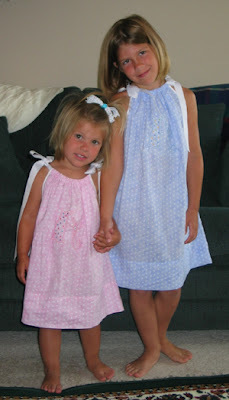 This morning I was delighted to have the opportunity to see both Abby and Anna in their coordinating pillowcase dresses. They looked beautiful together! Their glowing tans after a week at the beach was stunning under the soft pastel colors. 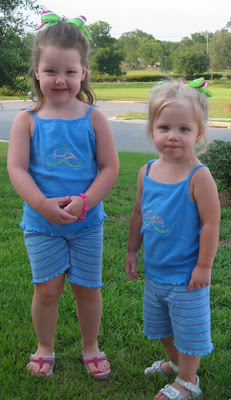 What precious girls! 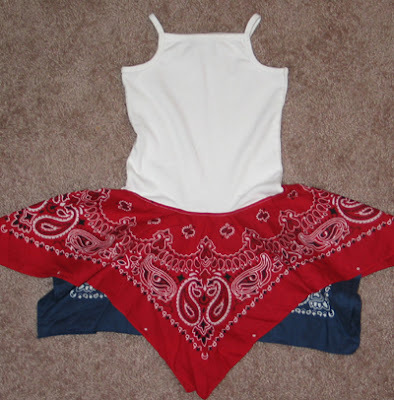 A Case of "The Tank Tops are Too LONG"
Yesterday I made two bandana dresses. 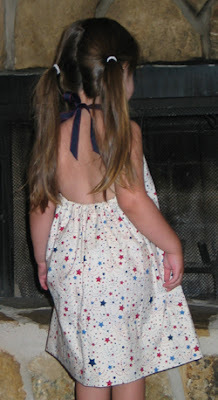 One is a Fourth of July dress for Ella, 2.5 yrs old. 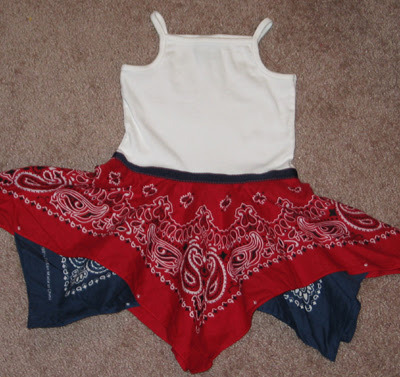 I took a 2T tank top and used red and blue bandanas to make the dress. Quick simple project, right? Well, what I didn't pay attention to is how LONG the tank top was. When poor Ella put it on, the waistline was a good 2-3 inches too low. That's significant on a little girl! So this evening I cut the skirt off, trimmed off about 2" off the shirt, and sewed it back on. 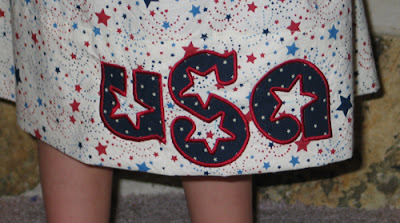 To cover all my stitching, I added navy ribbon (which has red accents you can't see in the picture). It turned out beautifully and now fits Ella perfectly! She wasn't too thrilled with the idea of getting her picture taken at that moment, but cooperated! Now I'll have to tackle the second one I made yesterday... It was for Keeley's 2nd birthday party. 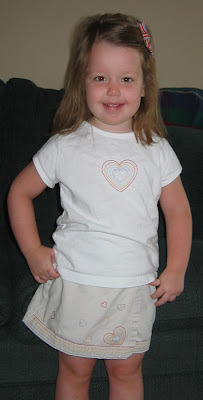 I used a 24 month tank top for her, pink and purple bandanas, and embroidered her initial on the tank. 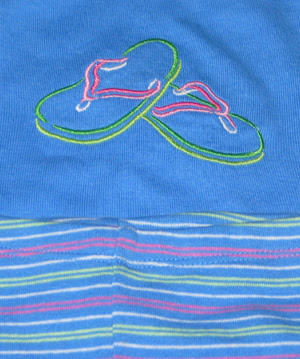 On Sunday I also embroidered the flip flops on tank tops for Kylie and Kenzie. 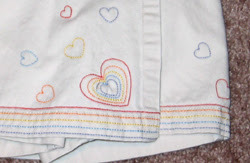 Please note their adorable hairbows (which perfectly match the embroidery thread and stripes on the shorts) that Valerie made -- Annaliese now has a matching bow, too! It's nice to have crafty friends to do trades with! Some day soon we'll get a pic with all three girls together. I received a fantastic phone call from Valerie today, "I'm at Target and they have their girl's spaghetti strap tank tops on sale for $2.08." She's not my best friend for nothing!! ;) Annaliese and I got our shoes on and headed out the door! 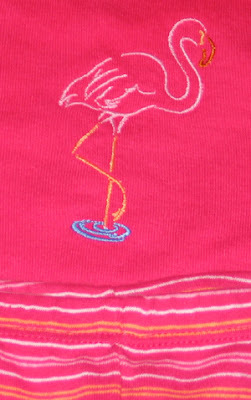 I was tickled with the thread selection to match the shorts!! 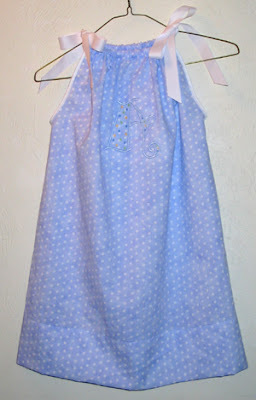 This is my first EZ 2 Make Pillowcase Halter Dress from http://www.ez2sew.com/index.php?main_page=index. In Trammel fashion, I chose not to do it the easy way the first time! I used a yard of fabric instead of a pillowcase. I knew I wanted to add applique to it, so I figured out where the center of the 4.5" cuff at the bottom would be and did the applique first. I was tickled with how well I got it placed! 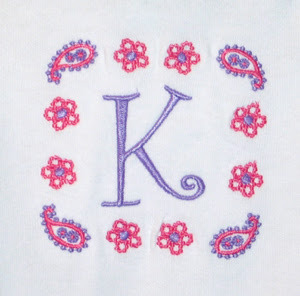 The embroidery design is from an applique alphabet freebie posted on Sew Forum. GOOD NEWS!! Even though it doesn't twirl, Annaliese agreed to wear it today!! June 10th will be my in-laws' 35th wedding anniversary. To honor them, I chose to make a quilted wall hanging similar to what I did for my parents last year (see below). 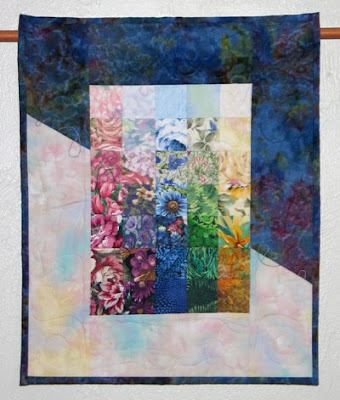 Harold and Kathy's watercolor quilt is also made of 35 squares, but the color arrangement and border is different. Each column has a focus color (pink, purple, blue, green, yellow) and transitions from light to dark. I pieced the border using a dark fabric around the the light section and vice versa, to make this transition more defined. I love how the fabrics that fall on the diagonal work so well (rose/purple flower square, green ivy dark/light spots, dark green leaf on yellow flower square, etc). Updated to add a picture of the original wall hanging for my parents since my online quilt gallery has disappeared into oblivion. :) I chose 35 small squares, trying to coordinate with the swag window treatments in their living room. I blended the navy, sage, mauve and gold in a colorwash effect. 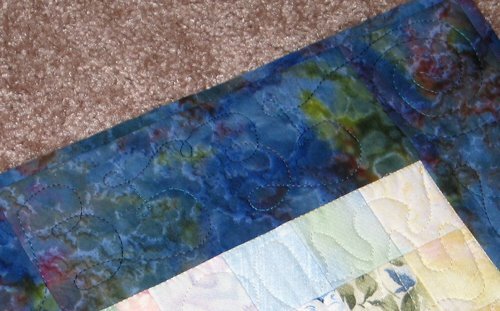 I used a lovely batik for the border and binding. 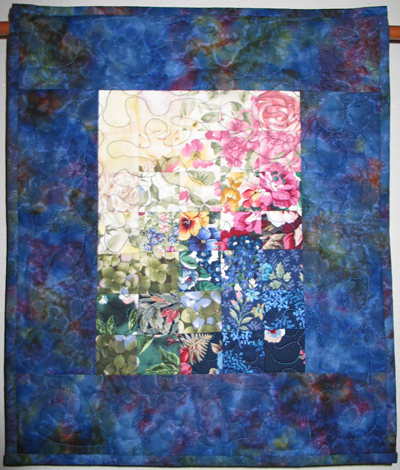 The 2" squares I used for these projects were leftovers from a huge watercolor quilt I made in 2003. A Case of "The Flower Colors Are Too Perfect"
Well... here's an embroidery project that I'm not overly thrilled with. 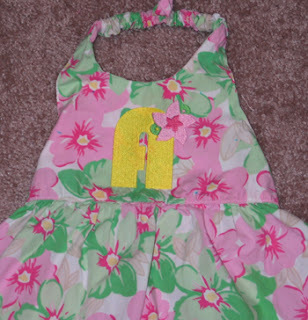 Annaliese decided she wanted the A to be yellow versus green, and I thought that'd be just fine, pulling out the yellow in the flowers on the dress. Then we picked the threads for the embroidery flower and leaves to match those on the dress. Hmmm... they are such a perfect match that the flower just blends in... I wish I had reversed the pinks! 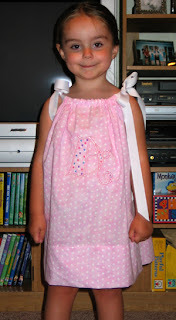 Oh well... at least this was another hand-me-down dress, so no money wasted! We'll see what Annaliese thinks when she wakes up from her nap. I like Daisha's suggestion of adding ribbon (or maybe ric rac) to the waistline. We'll see what I can find. She asked me if I could embroider a similar design on a shirt for her, so this is what I came up with. 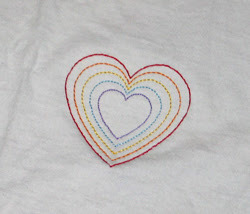 I took a quilting heart freebie from Splinters and Threads, and nested them at 140/120/100/80/60%. It turned out well; Valerie and Kylie seemed pleased! Here's my first pillowcase dress! I pretty much followed the EZ 2 Make pattern. Next time I'll use wide bias tape (the narrow was hard to work with), and I'll make the dress longer. But pretty good for my first try, especially since I made the pillowcase before starting! Friday I went shopping for bandanas, shirts, pillowcases (actually bought yardage of fabric instead) ribbon, bias tape and elastic. Today I'm working on the projects! 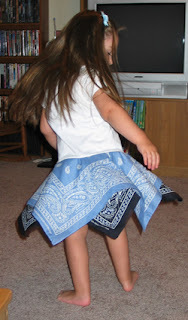 I decided to start with the easiest first, EZ 2 Make Bandana Dress. I need to embroider something on the shirt, but I didn't want to waste my time if I goofed up on the skirt. It turned out pretty well, although I'm not sure if the front point is actually centered. 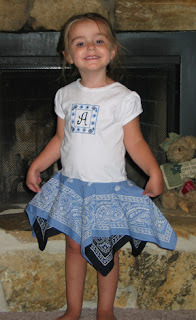 Centered or not, it makes a nice twirly dress, which is extremely important to a 3 year old! Any way, it was EZ2Make!